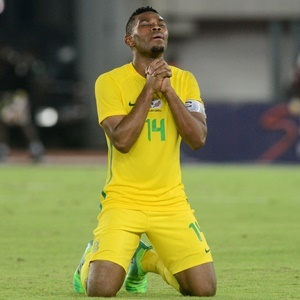 Cape Town - Bafana Bafana captain Thulani Hlatshwayo has called on all South Africans to rally behind the squad as they face Libya in a crucial 2019 Africa Cup of Nations qualifier on Sunday. "We are fully aware of what this match means to the players, the entire travelling delegation, the fans and the whole country, and we believe we have what it takes to ensure that we get the needed result, however, we urge all South Africans to rally behind the team this weekend for this all-important game,” said Hlatshwayo. "We all know that Bafana Bafana is a team that can unite the nation and bring some positivity around the country - and that is why we need positive energies back home for us to do well against Libya." "Everyone is highly motivated in the camp and we know that we have a good chance of winning this encounter. We have conceded only one goal in five matches and haven’t lost a game in the qualifiers – which is an indication that we are doing something right, we just need to finish off what we started," added Hlatshwayo. "We have to maintain our good form in defence, score the needed goals so they don’t even get a chance of coming back into the qualifiers – and, most importantly, stay focused the entire 90 minutes plus. The good thing is that qualification is in our hands, they need to win to overtake us, we have come too far to let it slip, hence the support from South Africans will be key." Bafana Bafana will continue training in Tunis before moving to Sfax on Thursday, to conclude their preparations.